A traditional beauty with up-to-date comfort features. This upholstered chair invites you to sink into its thickly padded seat and back cushions, while you delight in its kick pleat skirts and rolled armrests. 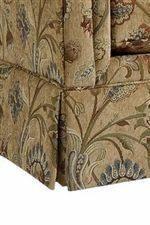 Design features include welted cushions and trim. Pair with the matching ottoman. 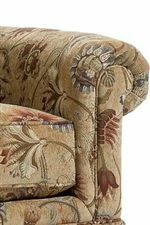 The Audrey Upholstered Chair by Broyhill Furniture at AHFA in the area. Product availability may vary. Contact us for the most current availability on this product.